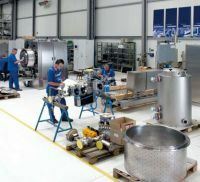 Service means to us to do everything so that your centrifuge, your dryer, your mixer and your fittings will work reliably and safely for producing an optimum product. We feel responsible for our machines and systems – from initial consulting through delivery, installation and maintenance up to the end of the entire life cycle. Through the partnership-like corporation with our customers around the world we jointly provide a top performance contributing significantly to your success. In a world in which markets and people move together ever more closely, our group of companies can assist you through its products, services and qualified staff. As one of the international leading vendors we endeavour to be as close as possible to our customers thereby ensuring utmost satisfaction. The constant endeavour regarding high quality, accuracy and reliability is a component of our everyday work firmly embedded on all levels. Our staff is being constantly trained so as to meet all aspects of the high process engineering and statutory requirements of the pharmaceutical, chemistry and metal industries.